Many years ago a ship was wrecked near an island called Belitung off the coast of Indonesia. In 1998, a fisherman discovered the shipwreck. It was found to be carrying a cargo of pottery, coins, gold and silver. This became known as the Tang Treasure and most of it came from Hunan in China. Experts who examined the shipwreck realised it was an important discovery. The discovery indicated that Arabia and China traded with each other by sea at least 1100 years ago. 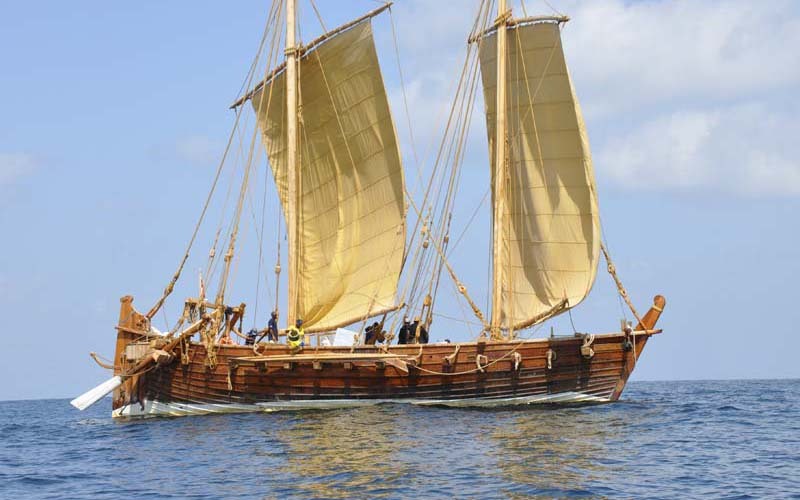 The Jewel of Muscat is a reconstruction of the shipwreck that was found near Belitung. It was built on the beach at Qantab in Oman. The ship is named after Muscat, the capital of Oman. Qantab is a small town on the coast of Oman near Muscat. The Jewel of Muscat was built on the beach there. Learn about Qantab by watching this video clip. The Jewel of Muscat sailed to Singapore, where it became part of a new museum there. Building a ship like the Jewel of Muscat was a very difficult task. The governments of Oman and Singapore worked together to bring the ship and its story to the world.